If I think back as far as I can to my earliest days as a metalhead, there has always been, at some point, SLAYER. By the time I was old enough to appreciate good heavy music, they already had four albums under their belt. I have not been a fan of their latest works, however. I think that may have something to do with Dave Lombardo/Jeff Hanneman, or the lack thereof. With the reintroduction of Paul Bostaph on drums I have a renewed interest. This album Repentless is set for release on my birthday September 11 via Nuclear Blast Records. The disc opens with an instrumental intro “Delusions of Savior” which leads directly into the title track “Repentless”. This is what I was hoping for. SLAYER of old. This song sounds like a reject from Divine Intervention. Heavy as all get out. Next up is “Take Control”. As I near eight minutes into the album, I am already quite surprised in what I am hearing. So far, a fantastic rejuvenation of one of my favorite metal outfits. SLAYER was in dire need of a great new album to support their almost too frequent touring of the Mid- Atlantic. “Vices” rolls in at track four and this is where guitarist Gary Holt starts to show his presence. The riffage provided is an awaking. A crisp slap in the face that has been lacking from the last three efforts. Bassist Tom Araya’s vocal hasn’t sounded this good since the 90’s. “Cast the First Stone” and “When the Stillness Comes”…damn it. This is what I was just talking about. Another retread. Seemingly the same lameness that has comprised the last few releases from one of the Big Four. The only redeeming quality to this track is the twin solos provided by Kerry King and Gary Holt. “Chasing Death” suffers from a different problem. Album filler. I am starting to feel as if Holt doesn’t have enough solo spotlight. King takes a solo that could have been much tastier and made an otherwise weak track better. Araya once again powers his vocal through. 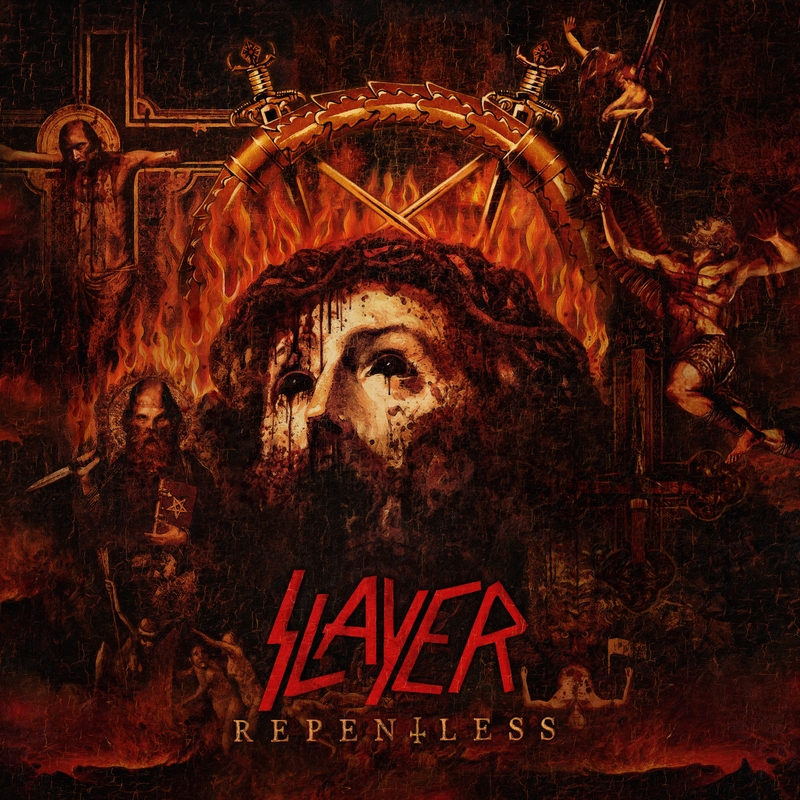 “Implode” is a track that shows all of SLAYER’S history surmised: speedy parts, screaming vocal, anti-religion lyrics and solos that are out of place yet fit in. At this point in the album, I must say the shining star is Tom Araya. His vocal has not been this good since God Hates Us All. “Piano Wire” is another bounce back track. Holt and King come together here fittingly. I almost wanted it to pick up but it never really gets to the explosion you are waiting for. “Atrocity Vendor” however delivers what we have come to really define SLAYER as. One of my favorites so far. The multiple solos, flaring guitar under harsh vocals, and dissonant riffs covered nicely in rhythm. “You Against You” is probably the closest you will get to early mid 80’s-era SLAYER. Now THIS is what we have all been waiting for. Best track so far. Damn. Sooooooo good. Three solos. Yes. Three. “Pride In Prejudice” is the closing track. Using the “Dead Skin Mask” template of crunchy riff over drum and bass thunder with an almost spoken word vocal. A fitting end to what is sure to be the band’s best release of their last six. I must say, this is what I was hoping for, but not expecting. A VERY solid album. Where have you been, SLAYER? This is what you want to hear from the band whose name can not be spoken. This is the album to make me go to another SLAYER show again. The reason I have seen them so many times. Do yourself a favor, buy Repentless. You will not be let down. I have a renewed interest for the heaviest band of my youth. Not many 30+ year bands release better material into their latter years. Especially considering the fact that they have lost two original members in the last two years. But Holt and Bostaph step in to overfill the shoes left vacant. You Can’t Stop Suicide Silence! !